News of a massive new Tolkien exhibition first became public in March of 2017, when the Bodleian website first announced "Tolkien: Maker of Middle-earth". Work had clearly started a long time before this announcement with tight cooperation with Marquette University to briefly reunite materials long separated, significant support from the Tolkien family and estate, and a partnership with Factum Arte to produce an animated 3D map of Middle-earth to be the centerpiece of the exhibition hall. All these groups and more put on what Richard Ovenden called “a once-in-a-generation exhibition” combining material from the Tolkien Archive at the Bodleian, the Tolkien Collection at Marquette University, and items from personal collections including Tolkien’s family. Exhibitions such as this one help draw attention to the archives, allowing the public to see material that is usually only viewable to scholars and researchers after going through the permissions process. They also can educate and enlighten the public on lesser known aspects of the subject - in this case, drawing attention back to the man and the wide breadth of spectacular life’s works after many years of attention on secondary creations based off his most successful books. Tolkien was an artist and writer from an early age, with the earliest work from Tolkien’s hand in 1904 on display up to his annotations on a Middle-earth map made in 1969, it is clear that Tolkien dedicated time through his entire adult life working on Middle-earth in one form or another. This exhibition would be the first time since the 1950’s that these materials were all in one place, and the first time ever they would all be viewable together by the public. The exhibition was a massive success, living on through Catherine McIlwaine’s eponymous catalogue, and a partnership exhibition at the Morgan Library going on now. Around the end of 1956 William Ready, Director of Libraries at Marquette University, approached Tolkien through an intermediary to see if Tolkien would be willing to sell his manuscripts for The Hobbit and The Lord of the Rings to add to the Library collection. This arrangement was finalized in May of 1957, and a significant amount of material was transferred across the Atlantic that June, with The Lord of the Rings material being sent mostly in 1958 and later additional material being sent by Christopher Tolkien when discovered in his father’s papers. Advertising poster from the collection of the Marquette University Libraries, used with permission. The first curated portion of Tolkien’s artwork was exhibited in 1976-1977 at the Ashmolean Museum in Oxford called "Drawings By Tolkien". The catalogue for this exhibition shows 82 items were on display, and very few of them are reproduced in the booklet. The largest exhibition focused on Tolkien was in 1992 called "Tolkien: Life and Legend". In this exhibition 250 items are listed in the catalogue, with almost all coming from the Bodleian archives - a few were donated by Tolkien's publisher HarperCollins, and a small number from Corpus Christi College and Exeter College from Tolkien's time there. In addition, other Bodleian exhibitions have included one or two items from their Tolkien archive, such as in 2002 and 2015, but "Tolkien: Maker of Middle-earth" is the largest exhibition in more than two decades, and the first to combine material from multiple collections around the world, and including material from private collections never previously viewable by the public. In the middle of March, 2017, the Bodleian first made a public announcement of their forthcoming Tolkien exhibition along with a major book written by the Bodleian’s Tolkien archivist Catherine McIlwaine. Early details were sparse, but still the anticipation was building throughout the year. The book and exhibition were clearly going to be incredibly popular, so much so that the Bodleian Library staff decided to implement a ticketing system for the first time ever so that everyone would have a chance to see the exhibit, and for international fans to be guaranteed a space in the hall during their travels which had to be booked well in advance. During the year-plus between the announcement and the exhibition opening, the teams involved were working hard behind the scenes in preparation. The Bodleian worked closely with Factum Arte to produce large 3D map of Middle-earth, that featured synchronized front and back projection to animate the story of The Lord of the Rings over time and geography. You can see a video of the making and installation of this incredible map on the Factum-Arte website. Also during this time Catherine and the editorial and publishing teams worked tirelessly on the exhibition catalogue, which turned out to be a meticulous record of the exhibit, but also an important scholarly reference and a lavishly produced art book all at the same time. The book was already going to press in February, with Samuel Fanous inspecting the sheets at the printer. Because of the long lead time between the book going to print and the exhibition opening, a few adjustments to the exhibition items are not captured in the book itself, but it is still an amazing record. Similarly, the Boldeian Libraries Shop was gearing up with multiple vendors and manufacturers, pulling together a wide array of merchandise to have ready for purchase alongside the exhibition. From pillows and silk scarves, to ceramic and jewelry, to journals and postcards and magnets and puzzles, and mugs and sundry other items, the effort to have something for every taste and pocketbook was months in the making and quite successful. Items from the shop were (and are) available from their website, and can be shipped worldwide. Just a few weeks before the exhibition would open, Marquette packed up the fragile manuscript items that were travelling to Oxford and shipped them off. These would be installed in the exhibition hall as part of the final touches to prepare for the official opening ceremony on May 31st. The exhibition would open to the public on June 1st, but there was a private reception and dinner being held the evening of May 31st as an official opening ceremony. 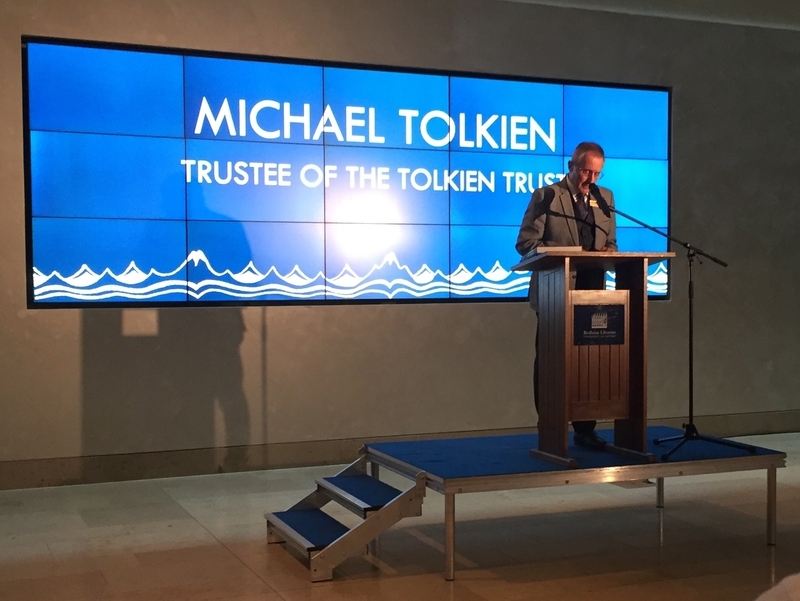 Approximately three hundred people gathered to hear the opening remarks from Richard Ovendon, Librarian at the Bodleian, and from Michael Tolkien, as well as to enjoy a reception with food and drink, a private viewing of the exhibition hall, and to purchase items from the shop. The exhibition’s public opening was warmly received and quite popular, with positive press coverage and visitors attending from all over the world. For a more personal review of visiting the exhibition and opening ceremony, this trip report gives a comprehensive overview. Marcel Aubron-Bülles also gathered together a wide array of reviews as well. The exhibition itself filled the space available as best as possible. A short public entry hallway had music playing and video projectors to set the mood, including maps on the floor and a giant Durin’s Door projected on the far wall to entice all friends to enter. The room was divided into multiple sections, each covering a time period of Tolkien’s life. The displays were not laid out in chronological order (either by Tolkien’s life or based on the timeline of Middle-earth) but instead encouraged wandering around and multiple visits to each section as threads of commonality and connection were found and followed. Tucked to the left of the entryway, this section was filled with various editions and translations of Tolkien’s books on Middle-earth, as well as displaying a selection of fan letters sent to him and some other fannish mathoms like buttons. Tolkien himself was quite surprised at the popularity of The Lord of the Rings and the fanatical response it generated, eventually having to mostly stop responding to fan letters and having a full time assistant (Joy Hill) dedicated to him from the publisher to help manage everything. Across from the “Reading Tolkien” wall and just to your left as you entered, this poignant collection of photos, artwork and letters gave a glimpse of the wonder and the pain that Tolkien grew up with - with his father unexpectedly dying when he was four years old, and his mother passing when he was twelve. He and his brother were left in the care of a guardian, and with what small support his extended family could provide, he made his own way into scholarships that would allow him to pursue his chosen academic career. On the reverse side of the glass case containing the “Childhood” display, here the visitor could see his blossoming creativity and hard work in school, his relationship with his soon-to-be wife Edith, and his close personal friends - half of whom would die in the brewing “War to End All Wars”. Tolkien was taught art by his mother at an early age, studied it formally at King Edward’s School, and then started experimenting on his own while a student at Oxford and beyond. His "Book of Ishness" and other vibrant, abstract artwork from the late ‘teens through 1928 were shown here against the far wall of the room, along with his abstract doodles on newspapers and other pieces of art he made through the 1960s. Tolkien was always using art as a creative outlet, whether trying to capture a real-world scene, or to capture emotion and feeling, or to mimic old illuminated manuscripts and their embellishments. Tolkien’s massive world-building effort, started in 1915 or before, absorbing The Hobbit, giving birth to The Lord of the Rings, and eventually seeing publication through his son’s tireless efforts in The Silmarillion and The History of Middle-earth, this truly can be said to be his life’s passion. The display case on the far right wall showed his Exeter notebooks filled with writings on the legendarium, various artwork he made, and even one of his works written out in Edith’s fair handwriting. (Apologies that there is no direct photograph of The Silmarillion display case available). This free-standing glass case covered a wide range of time, mostly showing Tolkien’s personal and professional life while he was a professor. His writing desk and chair, pipes and paints and pens, ephemera from World War Two and his teaching and the Inklings, there was a lot of material here that had never been shown publicly before, and possibly never again. Considered by many to be his best art, the thirteen pieces on display along the entire wall to the right of the entry (plus the Death of Smaug on the desk) were given prime placement, and were well spaced so that many people could view them as closely as possible. Tolkien made almost all of these on his own as a part of his creative process, and the publisher (George Allen & Unwin) loved them at first sight and did their best to include them. They even asked him to design the dust jacket, with the final draft in the Bodleian archive and an earlier one in the Marquette collection, shown together here for the first time. At the opposite end of the room, and again being given an entire wall, Tolkien’s art made for The Lord of the Rings was displayed. The pieces on display reflect the darker motifs and subject matter here, when compared to The Hobbit display. Greys and reds, burned manuscript pages and fire writings, this clearly is not a child’s story, and the lasting impact the book will have on the public is presaged here. Making maps was a large part of Tolkien’s creative process in writing his novels. It was very important to him to have the geography, distances, and environs accurate. Even the phases of the moon were important to him, to show the relationships between different groups of characters, and where they were relative to each other. His view of Middle-earth was always evolving, even decades after the books were published. The centerpiece of the exhibition room was the animated three-dimensional map of Middle-earth. Using multiple projectors above and below the translucent 3D-printed topographical map, viewers could see the paths taken and major events from The Lord of the Rings here. Also, tucked away in two far corners of the room, the original artwork for two Pauline Baynes posters was on display. She was a close friend of Tolkien’s and closely involved in illustrating many of his books. It was a thoughtful gesture to have her wonderful artwork shown here alongside his as her illustrations have long been associated with his major and minor works of fiction. The exhibition closed on October 28th. All reserved tickets for weekend visits were sold out by the beginning of the month, and all days were sold out by the 18th. Anyone waiting until the last minute would have to just hope that they could get one of the “at the door” tickets held back for this purpose. At the end of all things, the Bodleian staff reported that over 138,000 visits were made to the exhibition. There is no replacing the emotional impact of seeing a piece of art in person, but the catalogue put together by the Tolkien archivist and exhibition planner Catherine McIlwaine is a work of art in itself. A valuable reference book, a work of scholarship, and a quality catalogue of the exhibition, this book is an important contribution to Tolkien studies and belongs in any library. The exhibition was a great success. Many of the items have continued on to New York, where they are currently being exhibited at The Morgan Library. It is well worth a visit (or a second visit) to see Tolkien’s creations in person, and there are new items also being shown by The Morgan - this is an exhibition not to be missed. Some of the items will continue on to France in later 2019 - more information on this exhibition as it becomes available. I would like to reiterate my heartfelt thanks for the support of The Bodleian Libraries and Marquette University in writing this article, and for their permission to reproduce their photographs included here. It was fun to work on. I started working on it in 2017 gathering all of the announcements and social media posts leading up to the exhibition. Review by Marcel Aubron-Bülles of the exhibition at the Bodleian. Experiencing the exhibition in Oxford was an amazing experience. VISITOR numbers fell at Oxford’s Ashmolean Museum but rocketed at the Bodleian’s Weston Library, thanks to a major exhibition on JRR Tolkien. 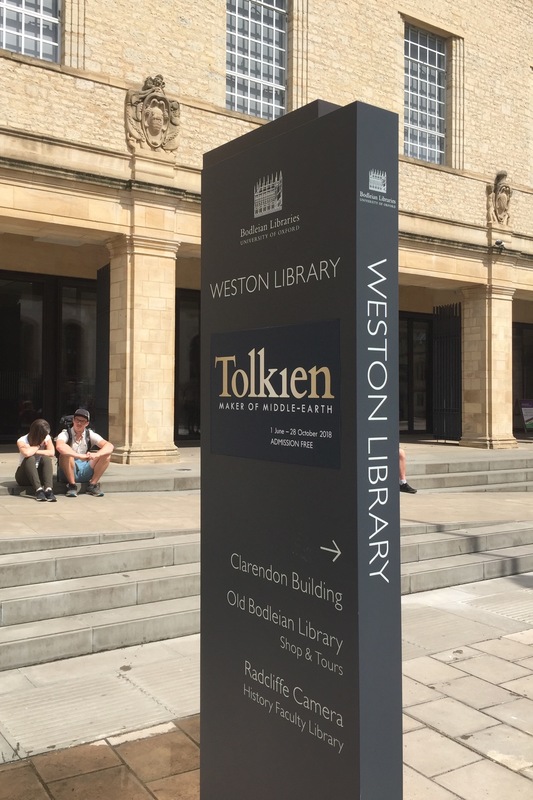 The summer of 2018 saw many indoor attractions experiencing a fall in visitor numbers because of the heatwave but the Bodleian enjoyed its most successful summer exhibition ever with Tolkien: Maker of Middle-earth. The once-in-a-lifetime show, seen by over 138,000 visitors, examined the full breadth of Tolkien’s unique literary imagination, from his creation of Middle-earth to his life and work as an artist, poet and scholar. While the Bodleian figures were up in 2018 to 910,806, visitor numbers at the Ashmolean were down seven per cent.